Microsoft’s has released an extended demo of its IllumiRoom project, giving as a glimpse as to what we could expect from the upcoming projector-based device. IllumiRoom aims to provide a “next-generation gaming console” experience, and may very well be one of the features introduced in Microsoft’s next console. 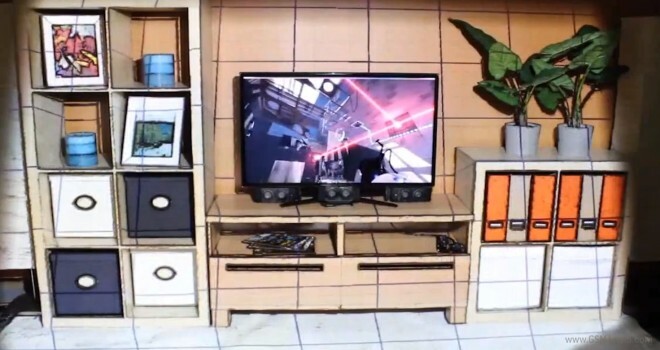 The project consists of a projector placed at a coffee-table level in front of the TV and a Kinect camera accessory for the Xbox 360. The cool thing is, the wall surrounding the TV doesn’t need to be a flat area, thanks to the Kinect camera sensor. Even better, the Kinect is able to transform the entire projected space into a 3D environment, even using the ground as part of the effect. Microsoft has remained fairly ambivalent regarding the inclusion of IllumiRoom in its next Xbox console, which has yet to be officially announced. Either way, the project brings a whole new meaning to the term immersive gaming, and we can’t wait to have it in our living rooms.